The gift certificate is available in $1.00 increments. Once you have added the certificate to the shopping cart, you must select how many you want. If you select 50, you will receive a $50.00 gift certificate. 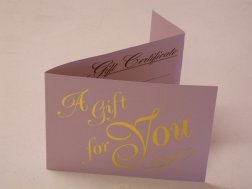 Gift certificates can be used for any type of purchase, from hard goods to living items. Each certificate is mailed via USPS Priority Mail, to you or the recipient. *** Please Note: Shipping will be $5.95 - we will adjust shipping when we process the order.